4 Chambre Maison sur Cours Harbour Town w / Piscine privée & Easy Bike to Beach! Située sur le 5ème fairway du Harbour Town Golf Links, cette maison de plain-pied a été entièrement rénovée et décorée par des professionnels. La grande salle à concept ouvert comprend une cuisine professionnelle avec des appareils électroménagers en acier inoxydable, des plafonds voûtés et 3 salons avec de grandes fenêtres donnant sur la piscine et le 5ème fairway & green de Harbour Town Golf Links. Cette maison est idéale pour les amateurs de golf et les amoureux de la plage. Les clients de 21 Battery peuvent profiter de toutes les commodités offertes par le complexe Sea Pines, y compris du club de plage Sea Pines, accessible via le chariot Sea Pines Trolley. N'oubliez pas de visiter la marina de Harbour Town avec son phare Candy Striped Lighthouse, la marina de South Beach, le café Salty Dog et des kilomètres de pistes cyclables parcourant le complexe. C'est une maison de plain-pied sans escalier. Wifi gratuit. we stayed in (25 Battery), great location but the A/C broke...?we moved next door and that A/C was broken as well. Also though expect roaches in Hilton Head, in the 20 years I have been coming I have never experienced it at the level encountered in both homes. Disgusting! On the flip side, the rental agents were phenomenal, very responsive! I would rent through them again, just not these houses. We had three couples sharing this house the first week of September. We found the house very clean and well equipped with all we needed. We loved the openness of the house, the 2 sitting areas, the pool and the kitchen! The location was great! Loved looking at the golfers go by! The only improvement I would like to see happen is a king bed replacing the twins and upgrading some of the mattresses. We had a great week! Our vacation was absolutely lovely! 21 Battery was in excellent condition. We cannot say anything bad about our experience- it was all great! We are already planning our next visit to Hilton Head and will look to rent 21 Battery again. We have a son in a wheelchair and the home was 100% accessible. Perfect! We complained about the condition of this house last year and thought we would try it again but it was worse this year. The refrigerator and dishwasher were filthy. Plus the refrigerator had only one shelf on the inside door. door. Our shower drain in the master bedroom had hair in it from the previous renter. Two bathrooms still had toothpaste in the sink from previous renters. A tree limb fell near my granddaughter near the pool. Thankfully it didn&#x2019;t hurt her, but a tree limb did fall on my daughter&#x2019;s car causing major damage. The landscaper told us he had told the homeowner&#x2019;s the trees needed pruning. Needless to say 21 Battery is off our list!! Forgot to mention that we had spiders making webs in the corners of the master bath. We selected this property for its single story, which created ease with the grandparents and toddler who were vacationing with us. Overall, we were satisfied with the home. We found the home clean, quite spacious and kitchen large and well stocked. 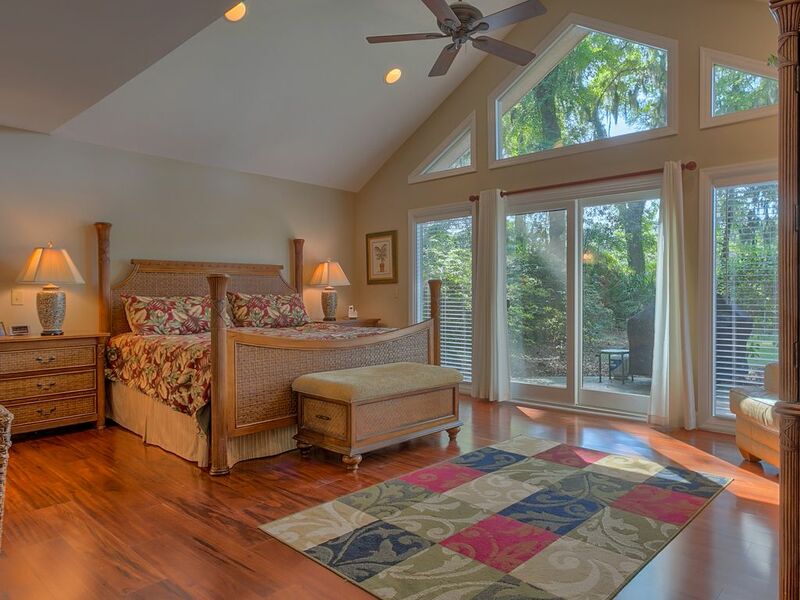 The layout of the home offered nice privacy, with each guest bedroom having their own bath. We appreciated the golf course views, although a very quiet course during our week. The beach access closest to the house is nice, but difficult for us to navigate the distance with a 1 year old. We found it easier to drive and park at the beach club. In general, we found the home comfortable for the 8 of us. A little constructive feedback. We did find the kitchen, while quite large, to be left with no room to put any of our own food away in cabinets. With a locked pantry, I would encourage the homeowners to clear some space in this large kitchen for their guests. We also had difficulty in keeping the master bedroom temperature cool enough. Fortunately, we had brought along a large fan which assisted, but there is a large temperature difference between the main living area and the master. The pool is quite chilly with no option to heat. Because of the trees, the pool gets little sun and subsequently, we had a difficult time using the pool, despite the 80-90 degree air temperatures. Finally, each guest is provided 1 washcloth, 1 hand towel and 2 bath towels for the week. This might work for some, but it was an inconvenience for our family. We found ourselves doing laundry with the very old washer and dryer mid week. In the houses I have rented before, I have never had such a limitation.